By Montagu Mail - Was it the Madiba magic that touched Simone that day in Montagu? 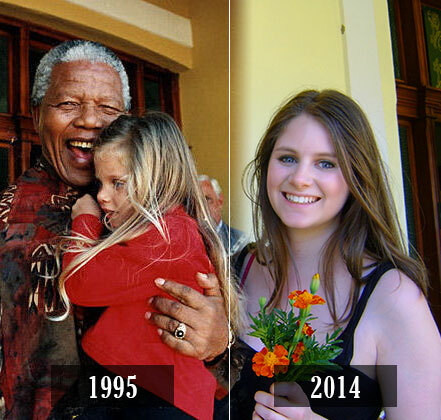 When Nelson Mandela visited Montagu in April 1995 a little white girl of only 4 years of age grabbed a bunch of marigolds, roots and all, from a flower bed at Kingna Lodge and stood there waiting. Marietta Barnes of the Tourism Association is said to have spoken up. "Mr. Mandela! There's a little girl here who wants to give you flowers!" The President responded immediately and called her up to the Kingna House veranda. He picked her up and had a little chat. Photographers seized the moment and various versions of the picture went around the world. David Parker's photograph was in last month's issue of the Mail as part of a tribute to Madiba after his recent death. An enlarged copy of the same photograph, signed by Mr. Mandela himself, also has a place of honour in a home in Sea Point where that little girl, now 23, has grown up. Her name is Simone Abramson. Her parents are Stan and Urlene. The family are regular visitors to Montagu where they have a second home.Perhaps touched by the Madiba magic, or maybe simply inspired by the moment and the contact, Simone has grown up to be a most spectacular person. She has recently graduated from UCT, but before she even started her studies there she had made her name and was famous throughout South Africa for an incredible invention. She was just a 16 year-old grade 10 pupil when she became a celebrity, winning the award for the best female project at the National Eskom Expo for Young Scientists, held at Pretoria University. Her 'Future of Identification' project had won her a gold medal and 'Best Project by a Female' award. In the earlier leg of the contest she shut out 480 other entrants. The invention, now patented, and very likely to have universal application and perhaps even take the place of fingerprinting, involves a new method of human identification by taking measurements at the back of the eyes. Since her father Stanley is a Cape Town Optometrist, her interest in the eyes may not be all that extraordinary, but for a 16 year-old to come up with the idea that she did is more than extra ordinary. To demonstrate the validity of her system Simone photographed the back of the eyes of more than a thousand randomly selected people. Simone was in Montagu over the weekend of January 25 with her boyfriend David Rabinowitz. We asked her to pose for us on the veranda at Kingna. The house owner, John Lewer was on hand to show us around in the footsteps of Madiba and the little girl that Simone once was!